Of the hundred of thousands of the territory visitors, Ernie Yarbrough and his son Shawn of Georgia, are different. While his family planned to tour Tortola and hit the beach, they had other plans—making a contribution to the development of sports. Yarbrough, the Associate Director of the High School Sports Association who also runs a baseball/softball academy, told St. Thomas’ Eric Philpert who works with him and umpires college softball games along with his son, he’d be stopping in the BVI. Phiplbert to told him to cast an eye on what Terry “Chino” Chinnery is doing at the Old Recreation Grounds Softball field, for youth development. 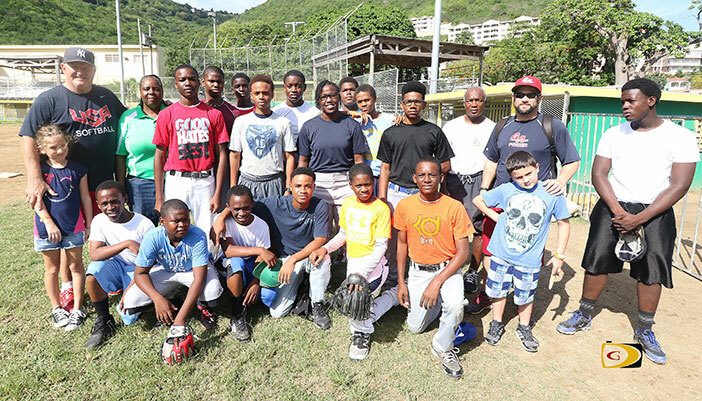 Yarborough who’s on the USA national softball committee and also on the national rules committee, was impressed with the effort he saw from the BVI players on Thursday after he got off the Norwegian Spirit. Chinnery who earlier in November had San Diego Padres Scout Chip Lawrence looking at his players, said he was surprised when he got the call from Philbert who he once coached on St. John.